Hornell Brewing Company is keeping it cool just in time for the height of party season with the introduction of a tropical themed malt beverage line, Coco Nutz. With the popularity of malt-based cocktails, Hornell Brewing Company focused on two of the most popular vacation destination cocktails, Miami Vice and Pina Colada. Coco Nutz Pina Colada is made with real coconut cream and contains 8% alcohol. The balance of fruit juice and coconut cream is true to the Pina Colada taste that is already known and loved worldwide. Coco Nutz Miami Vice is the sister-drink to Pina Colada containing real coconut cream and sweet strawberry flavor also containing 8% alcohol. “After exploring the opportunity to launch a malt-based beverage we created a line of ready-to-drink cocktails that celebrate the type of beverages people often enjoy while on vacation. We saw an opportunity to create a Pina Colada and Miami Vice flavored mixed-cocktail that could be enjoyed straight from the can or served over ice with friends. We are excited to see the category growth and consumer response,” said Executive Director, Spencer Vultaggio. 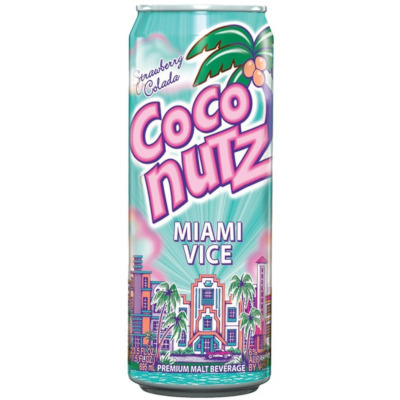 Miami Vice and Pina Colada Coco Nutz will hit shelves in 23oz cans with a bright and bold illustration of South Beach, Florida. Recommended to be served blended or over ice and with a garnish of pineapple or strawberry.